I stumbled upon a tv show on BBC Two that I absolutely love and thought I would share with my readers. It is called The Great British Sewing Bee and I’ve become addicted after just one episode. The premise of the show is similar to Master Chef where amateur chefs create dishes that are judged by famous chefs in the industry. In The Great British Sewing Bee a group of amateur sewers from around Great Britain are given a difficult sewing task each episode and complete over the course of many weeks to become Britain’s best home sewer. 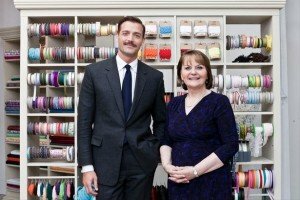 The show has actually been around for 3 Series and is a fascinating experience and is an example of the rise and popularity of sewing in the last few years. May and Patrick are the judges and have a wealth of knowledge and expertise in sewing. May has taught sewing for over 40 years and is an expert garment maker. Patrick has a fascinating story. His background is actually science and engineering and has no formal training in tailoring, but ended up purchasing the Savile Row tailors Norton and Sons back in 2005. His passion and good eye put Norton and Sons back on the map and is a thriving business. You don’t find a lot of sewing shows or anything about sewing on tv these days. This show does an amazing job of grabbing and keeping your attention. You really do care about the people and can learn a lot of great sewing tips and tricks along the way. It is a lot of fun watching each sewer’s approach to a task and see the creativity and ingenuity that each person brings to the projects they complete. It can get your imagination going and I’ve found myself keeping a notepad handy while watching so I can take any notes or write down any inspirational ideas that come to mind while watching. They use a great deal of techniques and on a variety of projects from light, delicate stitching to heavy duty fabrics. It is a joy to watch them tackle each task. 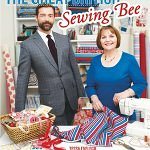 Where Can I See the Great British Sewing Bee? Most of us in North America don’t get BBC Two from our cable providers. Thankfully BBC puts a lot of their shows online for free. You can find all three series here on YouTube. One frustrating thing when trying to view on YouTube is that when you visit their channel the videos are listed in a weird order. I’m sure that most people would like to view them in order. At the end of each link you will see a capital “S” followed by two numbers then a capital “E” followed by two numbers. The “S” stands for Season and the “E” stands for Episode. For example, S01E01 is Season 1, Episode 1; which is probably where you want to begin. I’ve embedded that episode below if you want to start viewing now. Needless to say, I really enjoy the show and hope they keep it going for years to come! PS. They also have a nice book that is a nice companion to the show. It is geared more towards beginners, but I really enjoyed reading it and found that it was a nice sewing book to add to my collection. I think you’ll like it too. The Great British Sewing Bee and The Great British Bake Off are both wonderful shows. They prove that a reality program can be about something I enjoy doing and it can have competitors who respect and like each other. It’s just a pleasure to watch.